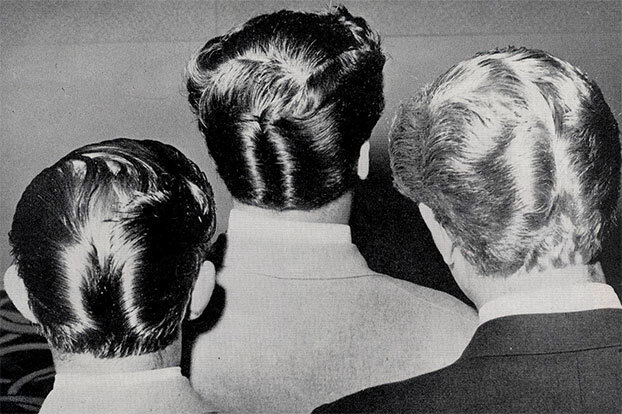 Sometimes referred to as the duck's tail, the ducktail, or simply D.A., the duck's arse hairstyle was the signature do for disaffected young mid-century men, from the zoot suit-wearing pachucos of the American west coast, to the Teddy Boys of London. Philadelphia barber Joseph Cirello claimed to have created the look around 1939. He allegedly experimented with the new style when cutting the hair of a blind boy who used to hang out in his shop. Apocryphal story or not, Cirello did undoubtedly popularise the look in the 40s and 50s via a clientele that included Elvis Presley, Frank Sinatra and James Dean. Above: James Dean, Frank Sinatra and Elvis Presley sport the tell-tale side wings of the D.A. hairstyle. For the D.A. style, hair would be combed back around the sides of the head and kept in place with pomade. A comb was then used at the back of the head to define a central part running from the crown to the nape, giving the look its name. The sides were styled to resemble the folded wings of a duck. With the D.A. 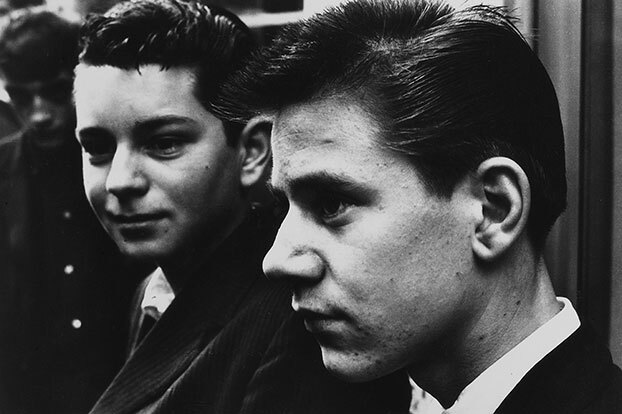 as the foundation, several styling variations emerged: the Elephant's Trunk added a tubular quiff projecting over the forehead as low as the nose; the Breaker involved long hair at the front being combed into a wave-like shape; and the Detroit, which teamed the long back and sides of the D.A. with a short flattop. Above: D.A. styles with additional Elephant Trunk (left) and Breaker (right). This is a short excerpt from the Mojo program. With in-depth information on the production and the era, the program is a magnificent way to extend and deepen your night at the theatre. Programs are available at the theatre for $10.